Bluedot Festival is back with a bang for what is sure to be an explosive third year. A fantastic four day event filled with the magical combination of music, science there is something for everyone. The newly announced line-up includes huge names such as The Chemical Brothers, The Flaming Lips, Future Islands, The Blue Plant in concert with Halle and many more. If that isn’t enough, there will be Dot Talks with leading scientists and thinkers as well as comedy acts, live gaming demonstrations, film screenings, space walks and kids workshops. To top it all off, Bluedot will once again be taking place on the amazing back drop of Jodrell Bank Observatory. So whether you’re looking to jam pack yourself with revolutionary knowledge, dance the days away or simply explore the famous grounds, BluedotFestival truly does have it all. As the official and exclusive travel partners of Bluedot Festival, Tuned in Travel is, as always, taking the stress out of transport. We will take care of everything for you, with large coaches being provided from all major UK cities: Chester, Chorlton, Fallowfield, Liverpool, London (Victoria), Macclesfield, Manchester, Preston, Sheffield, Stockport and Warrington. This is perfect for those travelling to the festival alone or in small groups. Tickets can be booked directly through the website, where information on departure times can also be found. For those travelling in larger groups there is the alternative option of private hire. Having a minibus dedicated exclusively to taking you and your friends directly to your cosmic weekend, you can relax knowing there is nothing to do but enjoy yourself. It’s super quick and easy to book or get in touch for a free quotation. Tuned in Travel is proud to be in collaboration with the festival industry initiative – Energy Revolution. While unavoidable, travel to festivals such as Bluedot contributes between sixty to eighty percent of the events overall carbon footprint. Together, we aim to balance fossil fuel travel miles, giving customers a chance to offset the pollutants generated during their travel with an investment into clean renewable energy. A donation can be made with your travel ticket purchase, 100% of which will be directly contributing towards creating clean energy. So by booking with Tuned in Travel, not only will you be taking the stress out of travel plans but you will also reducing your carbon footprint – how awesome is that? Take your first step towards booking your ticket and travel for Bluedot Festival with many of our packages. 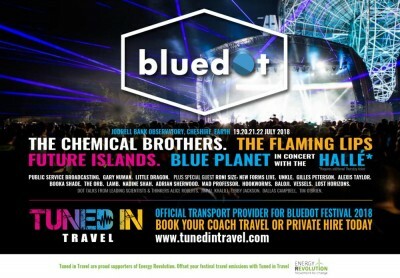 For more information on, Tuned in Travels available options, the Bluedot Festival or Energy Revolution, please see our website: www.tunedintravel.com.